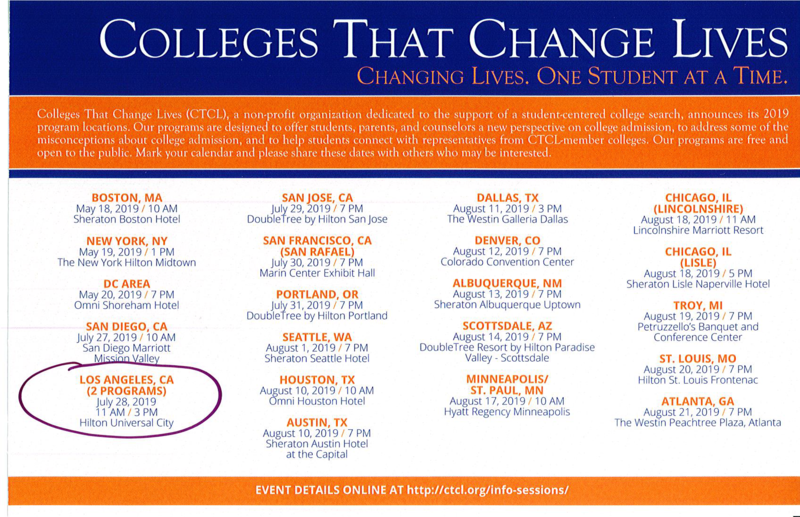 Since 1998, CTCL has offered a national series of information sessions and college fairs for students, parents, and college counselors. Each session begins with an enlightening 30-minute presentation on today’s college search process, which is followed immediately by a college fair that lasts for approximately 1.5 hours. During the college fair, students and families are invited to collect information from and speak directly with admission representatives from the colleges and universities that inspired the book Colleges That Change Lives. Find out what attracts applicants from the LA area to University of Wisconsin-Madison! We are hosting an information session designed for high school sophomores and juniors in the Los Angeles area on Sunday, April 7. You are also invited to attend to learn more and ask questions about our academic programs, on- and off-campus resources, and the application process. There will be an opportunity to meet local alumni and representatives from the Office of Admissions and Recruitment. Time: 12:00 to 2:00 p.m.
Join Brown, Chicago, Columbia, Cornell and Rice for an information session for prospective students and their families. Sessions include a brief overview of each institution, information on admissions and financial aid, and a chance to speak informally with admissions representatives. You must register to attend. We look forward to meeting you around the country this spring! Boston University will be hosting a reception for high school sophomores and juniors and their families. This is a wonderful opportunity for your students to learn more about BU and what makes an application competitive for admission. Please note that all students who plan to attend should RSVP on our website.